Have you noticed the wonderful new layout for shops on Etsy? As a seller and buyer I'm loving it! It took some time to get used to but now I think it looks so crisp and clean. And one shop that looks absolutely amazing with this new layout is Stitchez Baby Boutique. This boutique specializes in appliqued and stitched clothing and each girly outfit comes with a matching hair accessory. These are so super adorable! 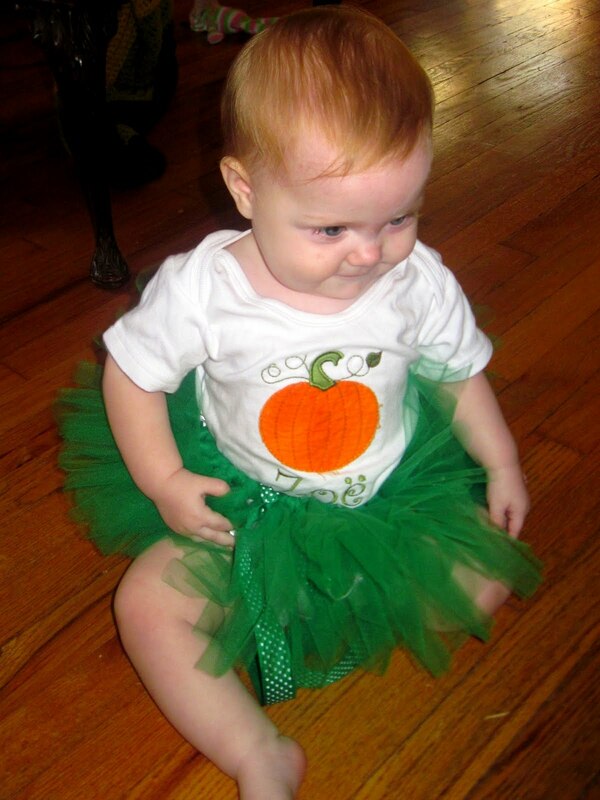 We received a onesie for Miss Zoë from Stitchez Baby Boutique's Halloween line. Zoë was born a week before Halloween so we got her a size 12-month onesie with a super cute pumpkin and her name. It's still a tad large for her (she's 10-months-old right now) but will be perfect at her birthday! Note that the tutu was NOT from Stitchez Baby Boutique but she does carry tutu outfits so be sure to check those out! Danielle, the artist of Stitchez Baby Boutique, used a technique that causes the edges of the pumpkin to fray with washing, giving the applique a more grunge feel. Which I LOVE! I love me some grunge. The stitching itself is impeccable. I also love that she can do larger appliques. Most artists I've come across can only do 4" designs but I like larger designs that fill the shirt or onesie. 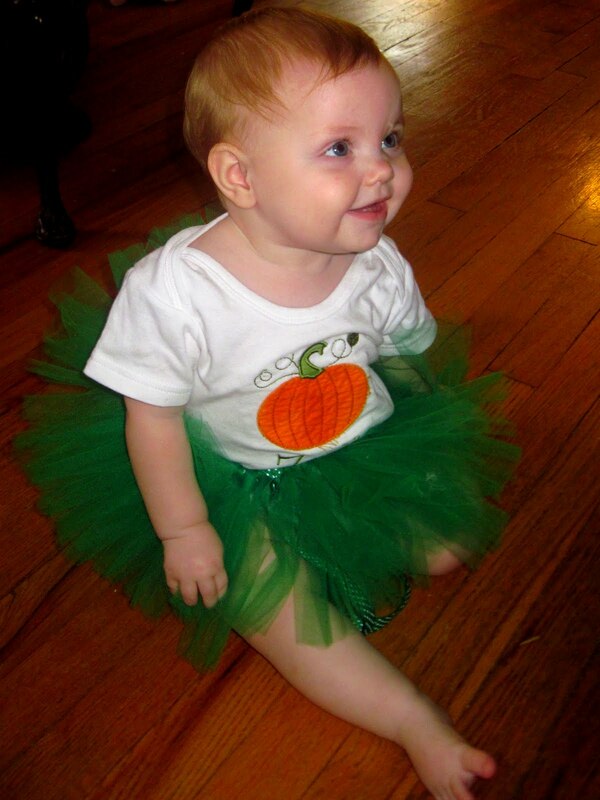 Danielle's current turnaround for Halloween is 2-3 weeks so if you need an adorable outfit or costume make sure you get your order in very soon. Her shipping costs are also really, really low! I always point that out because some people buffer their shipping costs so they earn a little extra. 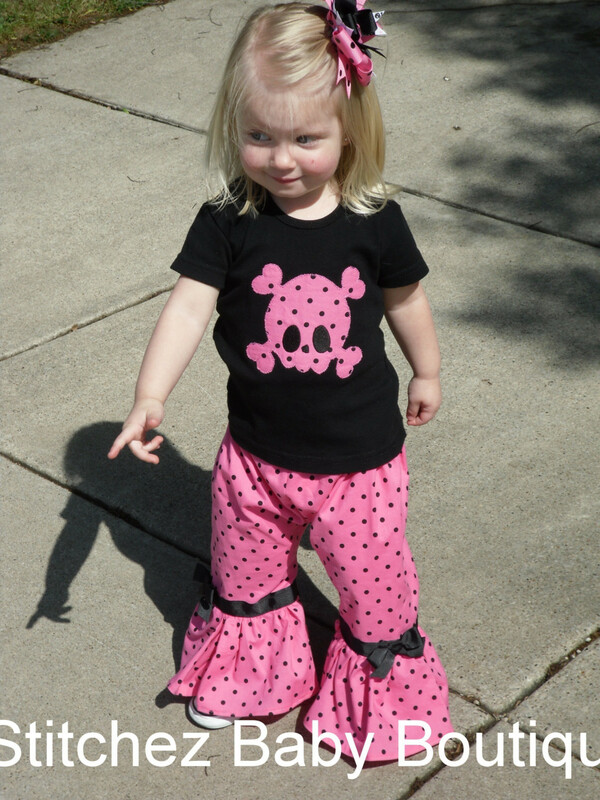 I love how fair Stitchez Baby Boutique is with their pricing and shipping! Whatever the occasion, whether a gift for a new baby or a cute outfit for the first day of school you will find something you love at Stitchez Baby Boutique. Do you see something there that YOU love?! Tell me about it! The comments expressed here are honest and based on my experience using a free item that I received from Stitchez Baby Boutique. The gift did not, in any way, affect my ability to honestly review this business. 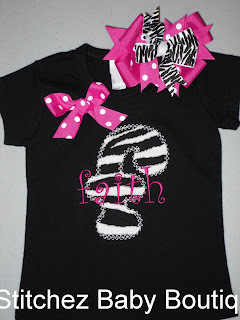 I'm in love with that top outfit that is zebra and pink... adorable!